Home to Scandinavia's tallest mountain, Jotunheimen National Park provides visitors with an experience of wild Norway at its absolute best. 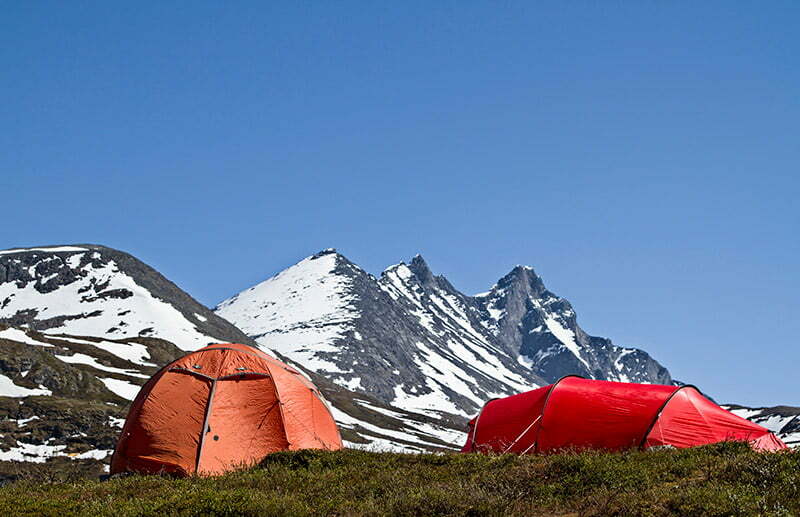 Incredible views, challenging hikes, free wild camping opportunities: Jotunheimen National Park is one of the best places to experience what Norway has to offer. Norway's 46 national parks offer access to nature that few other countries can match. You are free to pick berries and mushrooms (just make sure you know what's you're doing!) and even in the busiest parks it's easy to find quiet spots. Fishing and hunting licences are also available for many parts of the parks. One of the best known is at the very heart of the country. Established in 1980, Jotunheimen National Park covers more than 1,000 square kilometres of Sogn og Fjordane and Oppland counties. Known for its spectacular natural scenery, the park is also home to diverse wildlife. Reindeer, elk, mink and wolverines are among the species that call the park their home. More than 50 marked trails criss-cross the park with many more in the surrounding region. 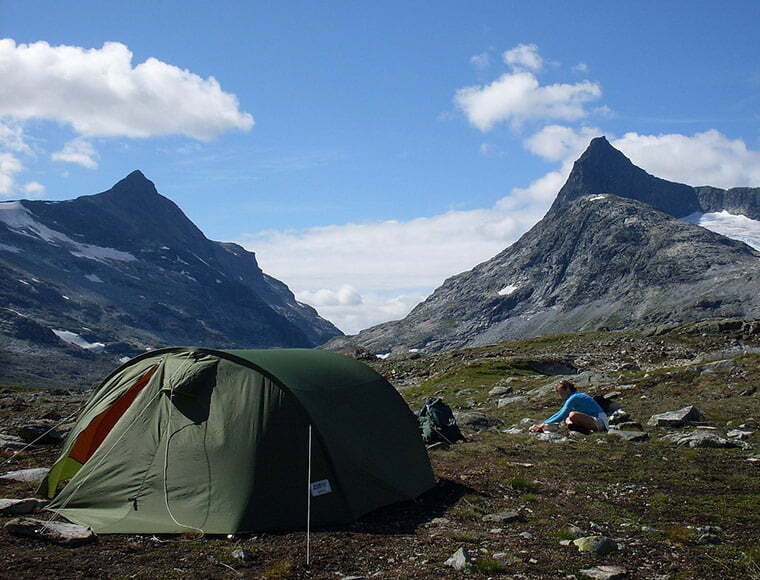 Peak season for hiking in Jotunheimen is from early July to the middle of August. The shoulder seasons of June and September can also be good, but this is more dependent on weather conditions. The mountain Galdhøpiggen is the bucket list destination for many visitors to the region, and with good reason. Despite its status as Norway's tallest mountain, it is nowhere near as difficult to climb as you might expect. Although its peak stands at 2,469 metres above sea level, an access road brings you up to the Juvasshytta mountain lodge at 1,841 metres above sea level, leaving a challenging but much more doable hike to reach the summit. That said, the climb is not one for beginners. The quickest and most common route involves crossing a glacier, which can only be done with the proper equipment and an approved guide. 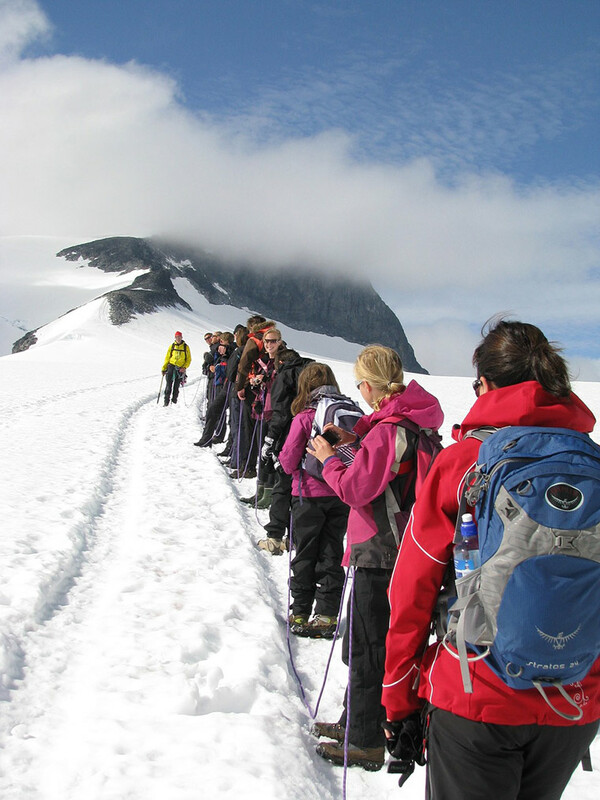 Experienced guides lead daily hikes to the summit of Galdhøpiggen, which includes a 45-minute rope-assisted crossing of a glacier. The starting point is the Juvasshytta mountain lodge, signed off route 55. All safety equipment is provided for the day-long hike, but you'll need your own good quality hiking boots, warm clothing, sunglasses, sunscreen, and water. Clothing and boots can be bought at the lodge, but prices are high. An alternative route without a glacier hike starts from Spiterstulen mountain lodge, also signed off route 55 near Lom. At four hours one-way this hike is not the shortest way to the summit, but as it's glacier-free it can be done without a guide. 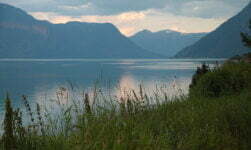 In the southeastern part of the park you will find one of Norway’s most iconic hikes. The narrow Besseggen ridge runs between Gjende and Bessvatnet lakes. One of the lakes is emerald green, the other blue, making for a truly memorable experience. The demanding 13km hike covers a total elevation gain of 1,100 metres and is an all-day undertaking. Despite this and the short season, more than 30,000 people make the Besseggen hike each year. The hike is considered something of a rite of passage among Norwegians, for whom hiking is a way of life. The hiking season is so short because of the snowfall, which makes skiing one of the most popular activities in the park. Late winter and spring are the best times due to the return of daylight and improved access by road. The varied landscapes with expansive plateaus and steep slopes are perfect for ski touring, while Nordic skiing, kite-skiing and cross-country skiing are all popular too. The most adventurous route is Høgruta, a six-day challenge over 80km of terrain including eight glaciers, seven kilometres of steep descents, and seven 2,000-metre summits. Needless to say, this one is for experiences ski touring enthusiasts only! Take the rare opportunity to ski on a glacier in full daylight from late May to late September. Many elite teams from all over the world choose Jotunheimen for their summer training. Where to stay in Jotunheimen National Park should be your number one priority when planning a trip. The short hiking season means accommodation is at a premium in July and August. Wild camping: It's free to pitch a tent for a night within the park. This is a popular choice among foreign backpackers. Mountain lodges: Within the park itself, a relatively small number of rooms in lodges and cabins are available for rent. 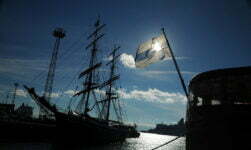 This includes the Juvasshytta and Spiterstulen lodges mentioned above. 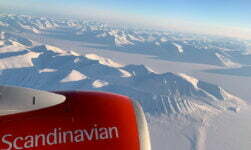 Contact DNT, the Norwegian Trekking Association, for details about the others. Besseggen: The lodges above are on the western side of the park. 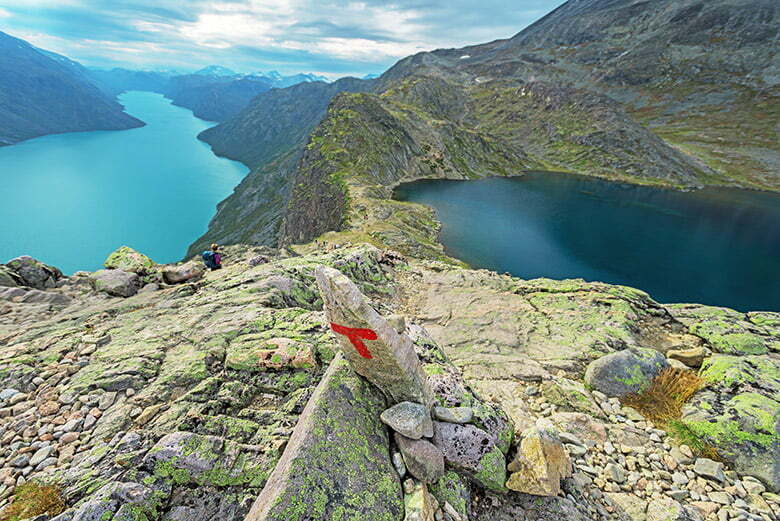 If you're attempting the Besseggen ridge hike you'll instead be on the eastern side. 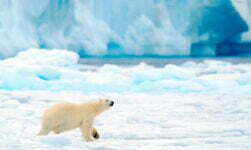 You should find something suitable among these seven accommodation options. Nearby accommodation: Given the relative ease to access the park, staying outside the borders is a popular option. I've written before about the charming Røisheim Hotel, a former farm turned lodge located on Route 55 by the turn-off for Spiterstulen. There are no TVs in the rustic guest rooms and the Wi-Fi is patchy outside the main building, so this is a good choice for those who want to disconnect. I'm not one for pushing rental cars in Norway as much of the country can be explored (albeit slowly) by public transport. The Oslo to Bergen train and Flåm railway connection down to the Aurlandsfjord being a prime example. However, although bus links are available to towns surrounding the park (notably Lom), the flexibility that a car offers is hard to beat. 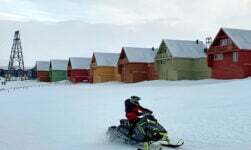 A good base to explore Jotunheimen is the small town of Lom located on Route 15, which links Norway’s main north-south E6 highway at Otta with the Geirangerfjord. Aside from its convenience for visiting the park, the town is notable for the attractive stave church, among the oldest and largest of its kind in Norway. While visiting the park, don't miss the opportunity to drive one of Norway's most spectacular National Scenic Routes. Originally the mountain pass from Sogndal to Lom was riddled with highwaymen looking to take advantage of the vital trade link between the coastal and inland communities. Today the road is one of the country’s greatest driving experiences and well worth planning a full day into your itinerary to fully appreciate. 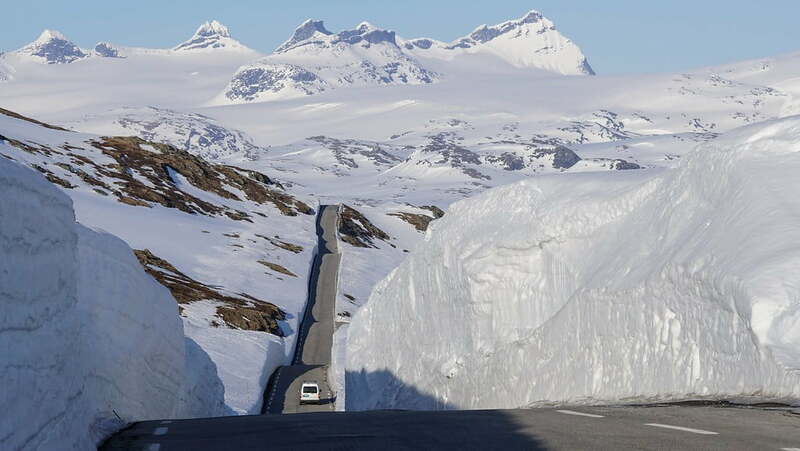 The best time to drive is straight after its springtime opening, when enormous banks of snow line both sides of the narrow road. Even at the height of summer, you’ll still see snow on the ground. Note that this road tends to be closed during the night. You can check precise opening details with the Norwegian Public Roads Administration.